Taking inspiration from Nomadic textiles, Amira rugs add a touch of authentic Morocco to the modern home. The design of the rugs is based upon traditional Moroccan tribal designs and each rug is created by hand using 100% pure new wool. 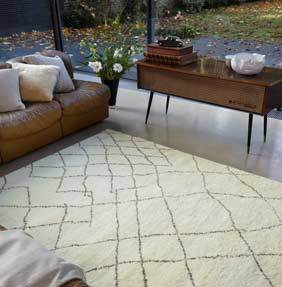 Each Amira rug has been hand knotted and washed and has a deep and luxurious 18mm, as well as a heavy, thick weight of 3.5kg per square metre. The luxurious quality of this rug and the choice of beautiful, understated colourways makes it a wonderful choice for many different styles of home. It is part of the Classic Heritage collection by Asiatic Carpets, which celebrates original oriental designs reimagined for the contemporary home.